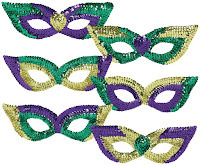 MARDI GRAS - The celebration of multi-cultural US society. The carnival is not just the riot of colors and costumes, it is the reaffirmation of the very essence of USA - equality and freedom. Though the celebration has roots in French tradition and popular just in southern states with French and Spanish culture, but it is becoming increasingly popular across the country. We all Americans look forward to be a part of the carnival. PartyBell, your favorite one-stop destination to shop for every occasion, is bringing you the most colorful costumes. The costume includes the long cape with the traditional bright green, purple and gold. The high collar add a regal touch to it. Add the Mardi Gras Mask and you are done. Make everyone turn their heads when you step out wearing this cute tutu skirt peacock costume. The costume includes corset, tail, choker and the headpiece. Complete the look with this feathered mask. This costume has been the most favorite till date. 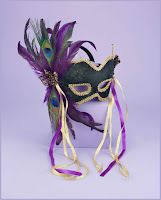 The bright Mardi Gras purple and green with gold embellishment add a royal touch to it. The skirt, top and coat can make anyone envy you. 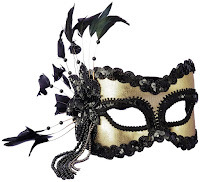 The black feathered sequined gold mask goes well with the costume. Dig in your hands in PartyBell and find endless options for yourself and your family and friends.